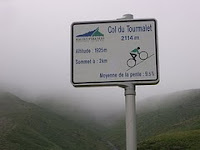 Stage 12 of the 2011 Tour de France today included three of my favorite rides in the Pyrenees. 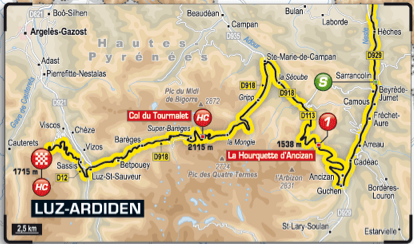 The Horquette d'Ancizan, Tourmalet, and Luz Ardiden. This was the first year the Hourquette was included in the Tour. Last year I specifically stayed in the nearby town of Guchan to ride the Hourquette. I heard about the climb online by other cyclists, similar to myself, that ride and then write about cycling in France. It was on my bucket list. Sadly I remember the hosts of the bed & breakfast where I stayed last year making the comment, "we all hope the Tour de France never discovers our little Hourquette." Oops. After you descend the Hourquette d'Ancizan, you may turn right to go up the Col d'Apsin, or turn left to go up the Tourmalet. What a decision! I had a blast this morning watching the Tour de France on TV and on Eurosport (on my laptop) so I didn't miss an inch of reminiscing at every corner and turn of the road through the Pyrenees. Today the riders take on three of the mountains that comprise some of my favorites memories of cycling in France. This is where the epic climbs of the Tour de France are located, where history is made and front forks are forged. Let's climb up the Col du Tourmalet, well-known as one of the best climbs in Europe. Sitting with a coffee, plate of berries, yogurt and granola, TV, laptop, watching the race live, I couldn't be happier. But it is all made more real by the simple act of texting a friend saying, remember when we were there. It was a great stage today, now we are talking Tour de France competition! All I have to do now is watch the Tour coverage reruns twice more today and I will be good. Even better, go back to the Pyrenees!